Children's party these days is never complete without the colorful personalized cupcakes. Foodamn Philippines recently celebrated our child's 7th birthday. Filipinos gives so much fuss when a child reaches seventh milestone. I remember Alicia Kim, a Korean co-parent being inquisitive on how often do we Filipinos celebrate our children's birthday. To simply explain the culture as to why she and her kids gets to party a lot these past months (Grade 1 level where most children turns 7), no matter how tight the budget or how lavish the concept of children's party are. Most Filipino parents gave a grand birthday party when a child turns 1, then 7th, followed by 13th(welcoming the teen years), then 18th for girls and 21st for the boys to welcome the adulthood or coming of age. Hence, if you can afford an annual party, go on! It's typically like a thanksgiving for good health, safety, abundant life and more awesome years to come. For Koreans they celebrate only during the 1st year. 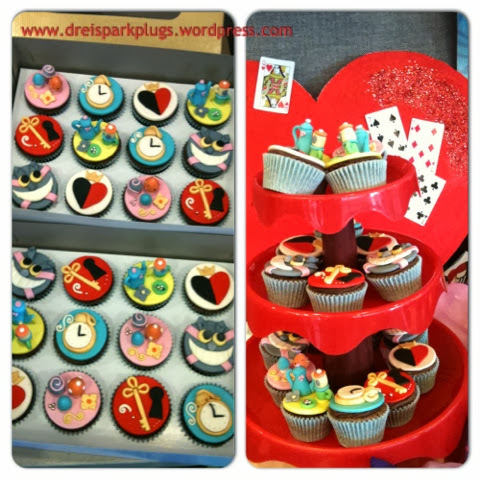 Manila Cakes and Cupcakes created this intricate design Alice in Wonderland theme cupcakes. Tricia Clemente, the girl behind the production of such cool birthday cupcakes is the sister of my sister's best friend. Each personalized cupcake cost Php80 each. They have a Facebook page: Manila Cakes & Cupcakes. For party cupcakes with custom-made design, Foodamn Philippines can hook you up with her, just give us a message. Disclosure: This article is being published based on my personal party/event set up. No business relationship involved with any company or organization promoting this event. Foodamn Philippines paid for the ordered products from Manila Cakes and Cupcakes.